Greetings friends, today I am entering a new to me challenge for the first time. The company is Quick Quotes and the theme is Blue/Silver. Well I have had this die sitting on my desk for a couple of days now screaming to be used, so this fit perfect. I hope you have enjoyed my card, please come back and see me again to see what other inky fun I am having. what a wonderful card! love that it is a shaker but so pretty even if it wasn't! thanks for joining us at Quick Quotes this month. Very nice!! Love it! Thanks for joining us at Quick Quotes! Just gorgeous! 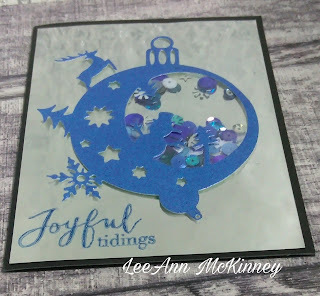 Love all the shimmers you added inside the ornament! Thanks for joining us over at Quick Quotes this month - hope to see you again for next month's challenge!